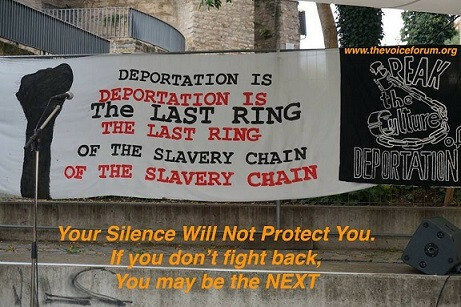 When a deportation is executed, it is the last ring of the Slavery and Colonial chain. Every racial, racist and murderous policies that comes before are there to legitimize and legalize and facilitate the last ring of the chain. It is nothing new that there is torture, subjugation, racism; arbitrariness, absurdity and repression accompany the regulation of the movement of people by states, particularly at borders. But a contemporary analogy takes us down the memory lane outlining the fact that deportation has not always been about the regulation of the movement of people by states, particularly at borders. It has been an instrument of power by the oppressors against the subalterns. This process does not start with repatriation; repatriation is just the beginning of the end. The actual deportation to other countries, not of the deportees is the added manifestation of these slavery and colonial powers. We should never forget that during the times of the Trans-Sahara and Trans-Atlantic slavery, millions of African women, men and children were deported from the motherland to other parts of the world to work as slaves. Kings and queens that resisted slavery and colonization were captured and deported to other parts of Africa but also out of the continent. Also during the times of the German Owa-Herero and Nama massacres and extermination in Namibia, those who escaped and resisted the Germans were deported to many other African territories including those controlled by Germany at that time, like Cameroon and Togoland. The same fate awaited freedom fighters of other African countries who resisted and fought their slave and colonial masters. In the recent extermination of the Jews in the last century, this could be perfectly executed through deportation into concentration camps in Germany and into other territories in Europe. And in all these times, deportation was legal just like today. Today, we may be fighting a different type of deportation but the rationales behind this murderous policy is the same, the extermination, subjugation and control of people deemed subaltern. There are individual and mass deportations by the European FRONTEX, with Germany playing a leading and conspicuous role, both in individual and mass deportations. The mass deportations have been an instrument to sustains imperialism, global capitalism, and global apartheid and has been taking racialized and militarized dimension. Citizens of so-called developing countries especially in Africa and now in war-torn Middle East Asia are more and more being targeted by powerful western countries, including Germany. This could only be made possible through coercive state apparatus, a vulnerable labor force and a global market for goods and services. While on the one hand, the deporter most often than not has a history of being the oppressor, the deportee has almost always a history of persecution. That is why; the fight to stop deportation and the anti-deportation struggles should be a fight that should go beyond the justification against persecution in our home countries or for integrationist and assimilative reasons. It should be seen as a fight against imperialism, capitalism, racism, slavery and colonialism. It is a fight against impunity and for a different world order. If we succeed in stopping deportation, it will be a revolution. The deportation culture did not start today but it should be stopped today. It is a part of colonial legacy and an injustice that should not go unpunished. This article was published first on 25. Sep 2017 (Updated 09. Oct 2017) in :: thevoiceforum.org/node/4400.